0 Comments Sunday, February 1st, 2015. 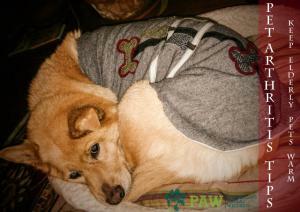 Dr. Shagensky’s dog Gertie faces the cold in West Hartford by snuggling up in bed in a warm sweater. She also responds well to Rimadyl for her arthritis. This is a time of year for parties, shopping, getting together with family, and generally surviving the craziness of the holidays. But with the change of season and weather, it is also possible for both people and pets to experience a physical change as well. Late fall and early winter are what Dr. Shagensky refers to as “arthritis season” in the Farmington Valley. It’s during that time of year that a lot of our senior dogs and cats with joint pain suddenly get much worse. With the coming of colder temperatures and damp weather, existing arthritis worsens significantly and pets who were “getting around ok” in the summer now are having more trouble climbing stairs, walking, or even getting up and lying down. These issues are compounded by a number of other things. Dogs need to go outside where it is very cold to urinate and defecate. Sometimes they have to do so in a foot or more of snow and ice. Posturing for these activities is a significant challenge for senior pets that they face daily. While we are keeping warm on a couch, in bed, or with blankets and layers of clothing, pets are typically on the colder harder floor surfaces. The air near the floor is significantly colder than it is a couple of feet off the floor and cold drafts are more easily felt lower down in a room or hallway. During the winter, exercise and outdoor activity for people and pets typically decline as well. Unused joints are often stiffer, more painful, and impose a lower range of motion than younger, healthy joints. Increased joint pain may not be the sole province of older pets either. Pets with previous joint injuries usually have a degree of arthritis present, and often have metal bone implants, even after surgical care. These pets may also be experiencing more discomfort at this time of year. Because arthritis is a very complicated disease process, finding a one-size-fits-all solution for every pet is next to impossible. Drugs or therapies that work in one pet may not have any effect on another. Fortunately there are many different strategies that can be employed. Arthritis medications (NSAIDs) are typically the mainstay for arthritis treatment, especially in dogs. Drugs like Rimadyl, Metacam, and Deramaxx are in the same class of drugs as Advil, aspirin, and Alleve but are specially forulated for dogs to be safe and effective. They will start to make your dog feel better very quickly and are powerful pain controllers, but should be used under the close guidance of your veterinarian. After running bloodwork and doing a thorough physical examination, your vet will help determine if your dog is healthy enough to take these medications. As of this writing, use of long-term NSAIDs in cats has not been approved by the FDA. Other human medications (e.g., gabapentin, tramadol) can also be prescribed by your veterinarian. Many people are familiar with glucosamine and chondroitin supplements for themselves and their pets. Recent studies have shown that by themselves, these may be of limited value, but in combination with other ingredients (e.g., avocado-soy unsaponifiables, MSM) may benefit both dogs and cats. For pets that require additional comfort beyond arthritis medications or for pets that cannot take NSAIDs, an injectable product called Adequan can be used. This shot can be given either at home or by your veterinarian and is FDA approved for the treatment of arthritis. In the Avon area, we at Progressive Animal Wellness offer both Adequan and the well tested glucosamine and chondroitin supplement Dasaquin MSM. A number of other arthritis treatments have gained popularity in recent years. Among these are accupuncture/chiropractic, cold laser therapy, massage therapy, and omega-3 fatty acid (usually fish oil) supplementation. While there are many reports of success with these treatments, success in large scale, well-reviewed clinical studies do not exist as of yet. More information is needed to find out whether or not these treatments can be applied to our pet population in general. So what can you do at home to keep your pet healthy, happy and comfortable? Keep your pet at a healthy weight. Even mild levels of obesity have been shown to cause premature arthritis or worsen existing arthritis. Keeping your pets’ joints moving with moderate exercise or passive range of motion exercises can be helpful as well. The best way to deal with arthritis in a Farmington Valley winter-keep your older cats and dogs bundled up by the fireplace or near a heating vent, keep them from overindulging and putting on winter weight, and we will see them through to happier days in Spring! Corey Shagensky, DVM, is the founder and owner of Progressive Animal Wellness (PAW) in Avon. He has been practicing veterinary medicine since earning his degree from Cornell University in 2004. He is a member of the American Veterinary Medical Association, Connecticut Veterinary Medical Association, the Avon Chamber of Commerce, and the Connecticut Alliance for Business Opportunities. His areas of particular professional interest include dermatology, endocrinology, oral health, and preventive medicine. An avid road bicyclist and gardener, Dr. Shagensky also enjoys cooking, baking, sailing, playing guitar, and trying to read as many classic books/novels as he can. He lives in West Hartford with his wife, Jen, their two children, and Gertie, a mix he rescued from the SPCA while at Cornell. Connect with PAW on Facebook, Twitter, and Instagram too. « Red’s Dental Health Story- Fewer Teeth but a Bigger Smile!